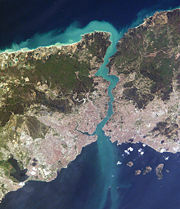 Satellite image of the Bosporus, taken from the International Space Station in April 2004, Source: NASA. The metropolis of Istanbul occupies both sides of the entrance to the narrow, 20-mile long Bosporus Strait connecting the Mediterranean and Sea of Marmara (south) to the Black Sea (north). The rugged uplands to the north of the city are forested and contain vital reservoirs. The Bosporus or Bosphorus, also known as the Istanbul Strait, (Turkish: İstanbul Boğazı) (Greek: Βόσπορος) is a strait that forms the boundary between the Thrace and Anatolian sections of Turkey. The world's narrowest strait used for international navigation, it connects the Black Sea with the Sea of Marmara (connected by the Dardanelles to the Aegean Sea, and thereby to the Mediterranean Sea). It is approximately 30 km long, with a maximum width of 3,700 meters at the northern entrance, and a minimum width of 700 meters between Kandilli and Aşiyan; and 750 meters between Anadoluhisarı and Rumelihisarı. The depth varies from 36 to 124 meters in midstream. The Bosporus Strait is considered the boundary between Europe and Asia. It has always been strategically important, and control over it has been an objective of a number of hostilities in modern history. Its shores are heavily populated as the large city of Istanbul, (with a metropolitan area in excess of 11 million inhabitants) straddles it. Istanbul, the only city in the world to bridge two continents, is the modern name for a city with a long history, previously known as Constantinople and Byzantium. Rebuilt as the capital of the Roman Empire in 330 C.E. by Constantine I on the site of an earlier Greek city, it later served as the capital of the Byzantine and Ottoman Empires until 1922. The Bosporus region and its long history as a crossroads of the world is replete with some of the greatest triumphs and tragedies of civilization. It has seen great empires come and go—both Christian and Muslim—each leaving their unique mark in architecture, religion, culture, and government. View of the Bebek neighborhood from the hills of the Bosporus. The name Bosporus comes from the Greek word Bosporos (Βόσπορος). Its etymology is from bous (βοῦς: ox) and poros (πόρος: means of passing a river, ford, ferry) (the similar Ancient Greek word for passage, strait is porthmos (πορθμός)), thus meaning "oxen passage," which could reflect the older history of the region. The ancient Greeks analyzed it as "ox-ford" or "shallow sea ox passage" and associated it with the myth of Io's travels after Zeus turned her into a heifer for her protection. It has also been thought to be a Thracian form of Phôsphoros (Φωσφόρος) ('light-bearing'), an epithet of the goddess Hecate. It is also said in myth that floating rocks known as the Symplegades, or Clashing Rocks, once crushed any ship that attempted passage of the Bosporus until the hero Jason obtained passage, whereupon the rocks became fixed, and Greek access to the Black Sea was opened. View of the Bosporus and Fatih Sultan Mehmet Bridge as seen from Rumelihisarı. In 1998, William Ryan and Walter Pitman, geologists from Columbia University, published evidence that a massive flood through the Bosporus occurred about 5600 B.C.E. "Ten cubic miles [42 km3] of water poured through each day, two hundred times what flows over Niagara Falls…. The Bosporus flume roared and surged at full spate for at least three hundred days." The review of sediments in the Black Sea in 2004 by a pan-European project (Assemblage – Noah Project) was compatible with the conclusion of Pitman and Ryan. Calculations made by Mark Siddall predicted an underwater canyon that was actually found. Some have argued that the resulting massive flooding of the inhabited and probably farmed northern shores of the Black Sea is thought to be the historic basis for the flood stories found in the Epic of Gilgamesh and in the Bible in Book of Genesis, Chapters 6-9. On the other hand, there is also evidence for a flood of water going in the opposite direction, from the Black Sea into the Sea of Marmara around 7000 or 8000 B.C.E. 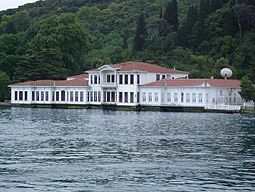 Historic waterfront houses stretch along the coasts of the Bosporus, such as this one of Kıbrıslı Mehmed Emin Pasha, Cypriot. Countering the hypothesis are data collected by Ukrainian and Russian scientists, such as the research of Valentina Yanko-Hombach, a geology professor of Odessa State University, Ukraine. Her findings predate the publication of the Black Sea deluge hypothesis. 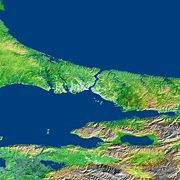 Yanko-Hombach claims that the water flow through the Bosporus repeatedly reversed direction over geological time depending on the relative water levels of the Aegean Sea and the Black Sea. This contradicts the proposed catastrophic breakage of a Bosporus sill on which Ryan and Pitman base their hypothesis. Likewise, the water levels calculated by Yanko-Hombach were different by a wide margin from those hypothesized by Ryan and Pitman. In 2007, Yanko-Hombach, now president of the Avalon Institute of Applied Science in Winnipeg, Canada, published a scientific volume featuring 35 papers by an international group of Black Sea scientists, including her own research on this topic. The book makes available much of the earlier Russian research in English for the first time, and combines it with more recent scientific findings. As of 2008, a cross-disciplinary research project funded by UNESCO and the International Union of Geological Sciences continued. 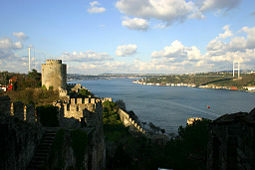 "The Bosphorus with the Castles of Europe (Rumelihisarı) and Asia (Anadoluhisarı)". Nineteenth century engraving by Thomas Allom. As the only passage between the Black Sea and the Mediterranean, the Bosporus has always been of great commercial and strategic importance. The Greek city-state of Athens in the fifth century B.C.E., which was dependent on grain imports from Scythia, therefore maintained critical alliances with cities which controlled the straits, such as the Megarian colony Byzantium. The strategic significance of the strait was one of the factors in the decision of the Roman Emperor Constantine the Great to found there in 330 C.E. his new capital, Constantinople, conferring on it the name Nova Roma ("New Rome"). This city came to be known as the capital of the Eastern Roman Empire. Constantinople ("City of Constantine") was the name by which the city became instead more widely known. This remained the principal official name of the city throughout the Byzantine period, and the most common name used for it in the West until the early twentieth century when it became known as Istanbul. On May 29, 1453 the city was conquered by the emerging Ottoman Empire. 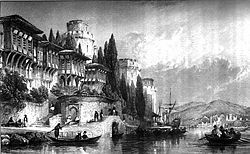 As the Ottoman Turks closed in on Constantinople, they constructed a fortification on each side of the strait, Anadoluhisarı (1393) and Rumelihisarı (1451). View of entry to the Bosporus from Marmara Sea, seen from Topkapı Palace. 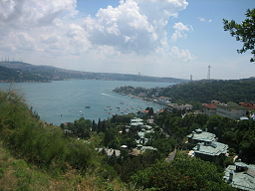 Panoramic view of part of the Bosporus, seen from Ulus neighborhood. The strategic importance of the Bosporus remains high, and control over it has been an objective of a number of hostilities in modern history, notably the Russo–Turkish War, 1877–1878, as well as of the attack of the Allied Powers on the Dardanelles in 1915 in the course of World War I. Several international treaties have governed vessels using the waters. Following World War I, the 1920 Treaty of Sèvres demilitarized the strait and made it an international territory under the control of the League of Nations. This was amended under the 1923 Treaty of Lausanne, which restored the straits to Turkish territory but allowed all foreign warships and commercial shipping to traverse the straits freely. Turkey eventually rejected the terms of that treaty, and subsequently Turkey remilitarized the straits area. The reversion to this old regime was formalized under the Montreux Convention Regarding the Regime of the Turkish Straits of July 1936. That convention, which is still in practical force as of 2008, treats the straits as an international shipping lane, but Turkey does retain the right to restrict the naval traffic of non-Black Sea nations (such as Greece, a traditional enemy, or Algeria). During World War II, through February 1945, when Turkey was neutral for most of the length of the conflict, the Dardanelles were closed to the ships of the belligerent nations. In the conferences during World War II, Soviet leader Joseph Stalin openly requested the concession of Soviet military bases on the Straits, even though Turkey was not involved in the war. This incident, coupled with Stalin's demands for the restitution of the Turkish provinces of Kars, Artvin and Ardahan to the Soviet Union (which were lost by Turkey with the Russo–Turkish War of 1877–1878, but were regained with the Treaty of Kars in 1921) was one of the main reasons why Turkey decided to give up its general principle of neutrality in foreign affairs. Turkey declared war against Germany in February 1945, but did not engage in offensive actions. Turkish troops fought on behalf of the United Nations during the Korean War in 1950-1953 and joined NATO in 1952. In more recent years, the Turkish Straits have become particularly important for the oil industry. Russian oil, from ports such as Novorossyisk, is exported by tankers to Western Europe and the United States via the Bosporus and the Dardanelles straits. The Bosporus Strait connects the Black Sea (top) with the Sea of Marmara (below center). The Bosporus Straits are one of the world's busiest (50,000 vessels annually, including 5,500 oil tankers), and most difficult-to-navigate waterways. The ports of the Black Sea, along with those in the Baltic Sea, were the primary oil export routes of the former Soviet Union, and the Black Sea remains the largest outlet for Russian oil exports. Exports through the Bosporus have grown since the breakup of the Soviet Union in 1991, and there is growing concern that projected Caspian Sea export volumes exceed the ability of the Bosporus to accommodate the tanker traffic. Turkey is concerned that the projected increase in large oil tankers would pose a serious navigational safety and environmental threats to the Bosporus Straits. Increased shipping traffic through the Bosporus has heightened fears of a major accident that could have serious environmental consequences and endanger the health of the nearly 12 million residents of Istanbul who live on either side of the Straits. In addition, while major spills can bring about immediate environmental consequences, the presence of large oil- and gas-carrying ships in the Straits causes other problems, such as the day to day release of contaminated water as the ships' ballast their holds. Pollution in the Straits contributed to a decline in fishing levels to 1/60th their former levels. Two bridges cross the Bosporus. The first, the Bosphorus Bridge, is 1074 meters long and was completed in 1973. The second, Fatih Sultan Mehmet (Bosphorus II) Bridge, is 1090 meters long, and was completed in 1988, about five kilometers north of the first bridge. Plans for a third road bridge, which will allow transit traffic to by-pass the city traffic, have been approved by the Ministry of Transportation. The bridge will be part of the "Northern Marmara Motorway," which will be further integrated with the existing Black Sea Coastal Highway. The location will be somewhere north of the existing two bridges, but the exact path is kept secret to avoid an early boom in land prices. Another crossing, Marmaray, is a 13.7 kilometer-long undersea railway tunnel currently under construction and is expected to be completed in 2012. Approximately 1,400 meters of the tunnel will run under the strait, at a depth of about 55 meters. ↑ Aeschylus. Prometheus Bound, 733. Project Gutenberg online version. Retrieved December 23, 2008. ↑ Quirin Schiermeier, August 12, 2004. Noah's Flood Nature PublishingGroup. Retrieved December 19, 2008. ↑ International Geoscience Programme. November 27, 2008. Black Sea-Mediterranean Corridor during the last 30 ky: sea level change and human adaptation Retrieved December 19, 2008. ↑ Igor Torbakov, January 10, 2003, The Turkish Factor in the Geopolitics of the Post-Soviet Space Foreign Policy Research Institute. Retrieved December 19, 2008. ↑ Robert M. Cutler. March 28, 1999. (Russian and) Soviet Relations with Greece and Turkey: A Systems Perspective RobertCutler.org Retrieved December 19, 2008. ↑ Robert O. Freedman, 2004, Russia's relations with Turkey Answers Corporation. Retrieved December 19, 2008. ↑ Ali Bulac, September 11, 2006, Against who and Where are we Going to Stand? Today's Zaman. Retrieved December 19, 2008. ↑ Cutler J. Cleveland, August 23, 2008, Bosporus Straits, Turkey Encyclopedia of Earth - available under the terms of the Creative Commons Attribution-Share Alike license. Retrieved December 19, 2008. Cleveland, Cutler J. August 23, 2008. Bosporus Straits, Turkey Encyclopedia of Earth. Retrieved December 19, 2008. Ryan, William, and Walter Pitman. Noah's Flood: The New Scientific Discoveries About The Event That Changed History. New York: Simon & Schuster, (1998) 2000. ISBN 0684859203. Yanko-Hombach, Valentina. The Black Sea flood question: changes in coastline, climate and human settlement. Dordrecht: Springer, 2007. ISBN 9781402047749. All links retrieved June 20, 2016. This page was last modified on 20 June 2016, at 18:23.